An eye catching room for sure, big red speakers and tiny electronics on the floor. 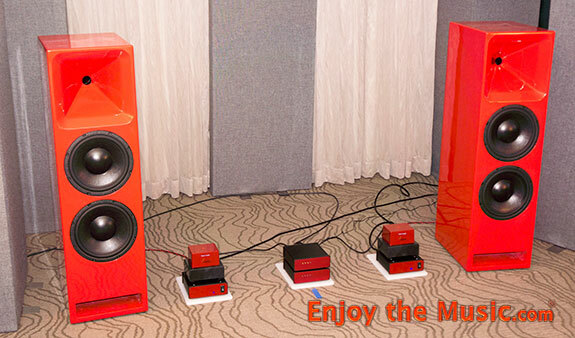 The big red speakers were courtesy of JTR Speakers, their Noesis 210RT models ($4598 per pair), a three-way design featuring a pair of 10" woofers in a vented enclosure, and a coaxial compression driver with unique annular diaphragms loaded into a wooden horn extending down to 400 Hz with 95dB/W/m sensitivity and get this, usable output level is 130dB! The rest of the system comes from Tommy O'Brien's Digital Amplifier Company, a pair of Golden Maraschino monoblocks ($6900 per pair), a DAC DAC, the TL (tube like) version($1290), and DAC cables as well. Tommy does not utilize any off the shelf modules as many do, but uses an in house brew which was designed to measure nicely, then modified to sound better with real world speaker loads. The DAC design goals are to have very short signal paths, higher switching frequencies than ordinarily available OTS, low negative feedback, and to be DC coupled for extraordinary bass response. The small footprint of the Golden Maraschino amps belie their power, 200W @ 8 Ohms, and 400W @ 4 Ohms, tiny but powerful. They even make a version called the In-Line Maraschino that forgoes the fancy box and is designed to hang off the back of your speaker by it's binding posts virtually eliminating speaker cables, I'm going to investigate those cherries more carefully. I visited this room on Sunday and most everyone was in a show's ending party mode, so we played a favorite, Fleetwood Mac, and I listened to "Go Your Own Way" loud, fun loud, and loved it. No strain, clean, punchy bass, and dynamically alive. "Songbird" played next and Christine McVie's voice was nicely focused and dead center, and the piano was percussive and dynamic at a lower level. It's hard to tell at a show, but I think Tommy's Maraschino amps are a better take at Class D than some others, worth a try, especially with their 30 Day money back guarantee.